The animal used a novel strategy to become super-sized, involving very fast growth spurts and efficient bird-like lungs, say palaeontologists. 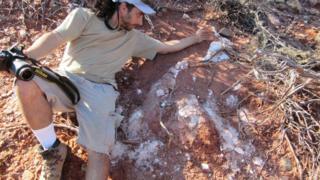 The fossil was found in the northwest of Argentina during a field trip. 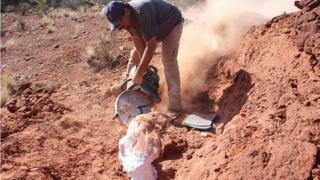 The scientists found four skeletons in all, one of a new species and three of related dinosaurs. The dinosaur dates back to the Triassic, about 47 million years before the iconic long-necked plant-eaters Diplodocus and Brachiosaurus appeared on the scene. It wasn’t as large, weighing about 10 tonnes. But its discovery is a surprise, coming so early in dinosaur evolution. The new dinosaur species Ingentia prima and similar species are grouped together as “lessemsaurids”. What is really unexpected is that the lessemsaurids achieved their huge bodies independently of the gigantic sauropods like Brontosaurus and Diplodocus, which did indeed evolve later during the Jurassic. The development of huge size wasn’t just a one-off event for the sauropods, but rather different types of dinosaurs were able to become colossal, which speaks to just how incredible these animals were. What was the new dinosaur like? It is a member of a group called sauropodomorphs, meaning “lizard-foot form”. These eventually evolved into the four-legged creatures that became the largest animals that ever walked the land. 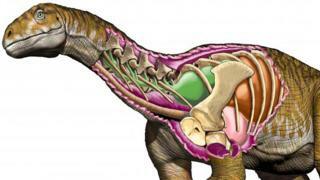 The dinosaur had an elongated neck and tail, although not on the scale of Diplodocus. It was about 10m long. How did it grow so big? Growth rings seen in its bones show it grew very fast. “We could observe in the bones [from the growth rings] that they had markedly high-growth periods,” said Dr Apaldetti, who was among the team to find the dinosaur. 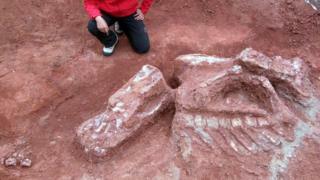 Her group’s investigations show that there is more than one way to super-size a dinosaur. The findings are published in the journal Nature Ecology & Evolution.